What is the Naevus of Ota? The Naevus of Ota, which originally was described by Dr M.T. Ota and Tanino (Japan) in 1939, is a hamartoma of dermal melanocytes. which clinically presents itself as a blue, grey or dark grey patch on the face, and is congenital or acquired and is within the distribution of the ophthalmic and maxillary branches of the trigeminal nerve. The naevus of Ota can be unilateral or bilateral, and, in addition to skin, it may involve ocular and oral mucosal surfaces. The sclera is involved in two-thirds of cases, causing an increased risk of glaucoma. It should not be confused with Mongolian spot, which is a birthmark caused by entrapment of melanocytes in the dermis but is located in the lumbosacral region. Women are nearly five times more likely to be affected than men, and it is rare among white people. Naevus of Ota may be congenital or not, and may appear during puberty. What is the Naevus of Ito? The Naevus of Ito, initially described by Minor Ito in 1954, is a dermal melanocytic condition affecting the shoulder area. The Naevus of Ito often occurs in association with the Naevus of Ota in the same patient, but is much less common, though the true incidence is not known. Naevi of Ota & Ito are melanocytic skin growths for which no effective therapy was available until laser therapy was developed. Laser therapy has been successfully used for the removal of these naevi. 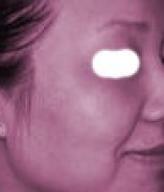 Q-Switched Nd:YAG laser has shown the best results in eliminating the Naevus of Ota and the Naevus of Ito. Patients might need 3 - 5 sessions of laser treatment in general for full eradication of these specific naevi. No complications and no side-effects have been noted up to this date. Naevus of Ota was formerly treated with cryosurgery, dermabrasion, etc. Besides giving unsatisfactory results, these treatments also gave long-standing complications, such as scars. However, with the development and integration of lasers in medicine, things have definitely changed to the better side. 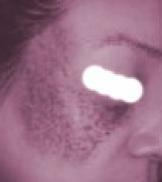 Q-Switched Nd:YAG lasers as well as Ruby and Alexandrite lasers have proven to be effective in treating the melanocytic skin growths - Naevus of Ota and Naevus of Ito. Actually, the Nd:YAG laser is widely used to remove the naevus of Ota due to the former's efficacy as witnessed by the photos found here. There is no need to go abroad for such treatments. You now have this facility at the VIP Laser Clinic right here in Mauritius!